We heard that Caples was good again so Ian and I went to check it out. Turns out most of the good stuff that was on the beach was still underwater. The problems close to the shore were primed though. 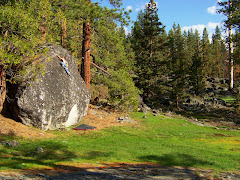 We climbed the Pearl v6 and then ended up finding new granite boulders in the trees behind Excalibur. Ian and I put up three new problems . Everyday Something v9 follows a super cool and pure slopey lip traverse. The holds are cool and skin friendly. It is pumpy. Maybe 15 moves. Right around the cornor we found another overhang with neat sloping features and a knee bar for the sit start moves. It starts matched in a sloping undercling and goes out a tricky sloper finish. That problem is called Practical Demonkeeping v9. Really good line. Next to it was a short wall with a v5 we put up called DavesMom. Big moves with a hard sit start. In a day at Erratica Ian Cotter Brown did the first flash of Master Blaster v9 and then ended the day by sending Krull v9 rather quickly. The temps are good and this weekend is going to be another smasher. The movie is tomorrow. I'm psyched to see the new footage from this year.